Patterns—the fabrics I find and incorporate into my paintings—are such a driving force in my work that it’s inevitable that I would eventually gravitate toward inventing my own patterns. I’ve used made-up painted patterns in some of my paintings in the past. For the most part, I’d concentrated most of my attention on the motifs, the individual repeated elements, usually abstracted from things in the paintings. I’m always attracted to novelty motifs in fabric, vintage and otherwise. But pattern’s underlying structure has been a growing fascination for me. The structure and design principles of pattern are closely related to those used in composing a painting, and also have deep connections to sculpture, architecture, the decorative arts, and design of all kinds. It’s surprising how infrequently it’s taught anymore. Many of the best instructional materials I’ve found on the subject are decades out of print. The Bauhaus folks got it: The simplest motif, a circle, say, put through variations of scale, weight, and structure, can yield an infinite number of patterns that you’d be tickled to wear, cover your walls with, screenprint on a card, glaze on a pot, or compose an abstract painting around. This summer I’ll be offering a four-week class that delves into the elements and underlying structure of pattern. I’ve developed some Bauhaus-inspired experiments that use the basic building blocks of form—there are nine!—and six scaffolds—don’t you love it when you can quantify things? !—to start hacking away at that infinite number. To boil the subject down to its very essence, the exercises will be in black and white (not even gray), and use just ink and cut paper. 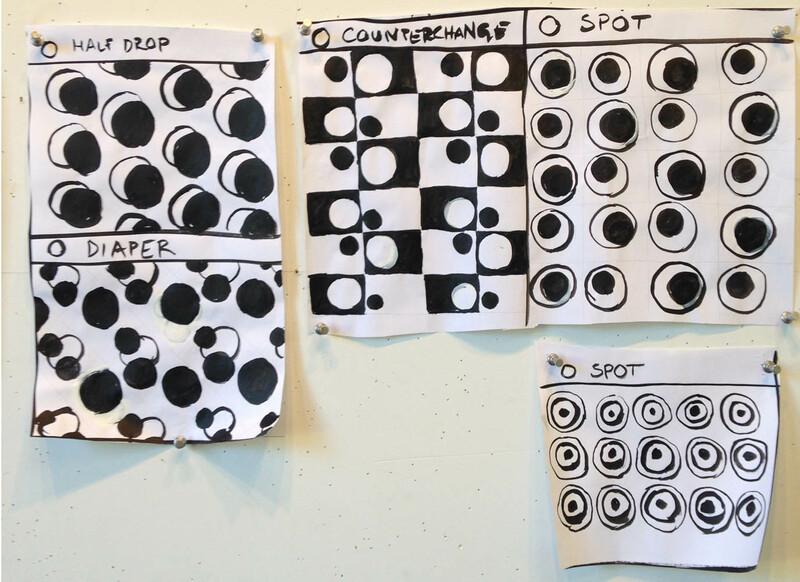 The goal is to become fluent in the language of pattern, to see it in unexpected places, interpret its structure, and to be able to use that heightened perceptual vocabulary in your own work. Register here, or contact me. In the interim, I’ll be periodically posting some thoughts and observations about patterns I encounter in my wanderings.